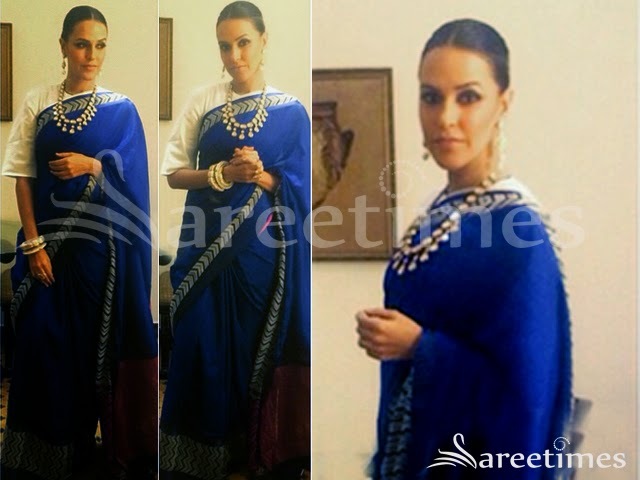 Neha Dhupia at a jewellery exhibition in a geometric print Payal Khandwala saree. Neha Dhupia at a recent event in a monochrome chevron striped saree by Payal Khandwala. Neha Dhupia At Madhav Jyoti Alankaran Event in designer handloom cotton saree designed by Anavila with horizontal striped lines over it, paired with plain sleeveless deep necked blouse. 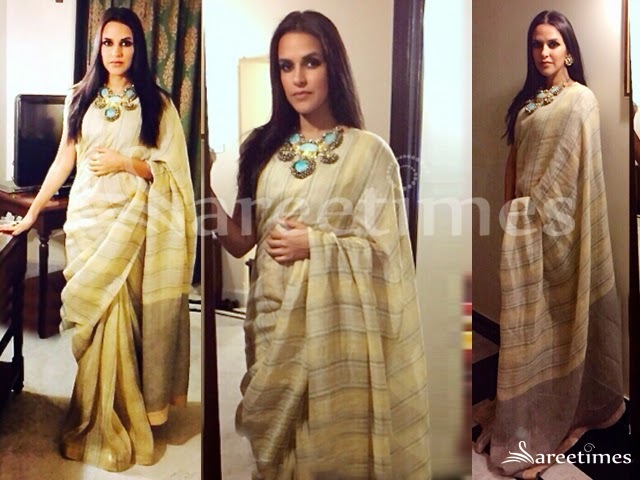 Neha Dhupia at a wedding function in Delhi wearing a raw mango saree. Blue and pink traditional weave saree paired with a t-shirt blouse. Actress Neha Dhupia at “Ekkees Toppon Ki Salaami” trailer launch event wearing a traditional plain pink color saree designed by Payala sighal. 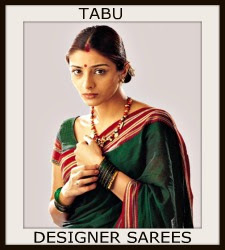 Silk sari and plain border paired with sleeveless closed neck blouse. Bollywood and South Indian actress Neha Dhupia walked for jewellery brand Geetanjali Gems on the first day of India International Jewellery Week (IIJW) 2014. She looked beautiful in purple designer net lehenga with double border. Gold Embellished patch work around it border. Silver embellished work all over lehenga. It is a purple netted dupatta. Embroidered work all over dupatta with patch work border. 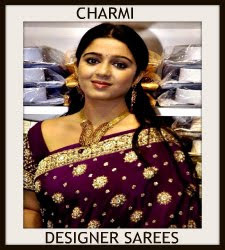 Paired with designer embroidered full sleeves saree blouse with square neck pattern. Bollywood and South Indian actress Neha Dhupia in beautiful black plain lehenga with black velvet border. 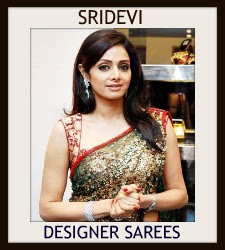 Designed by Vikram Phadnis at Swades Foundation Event. 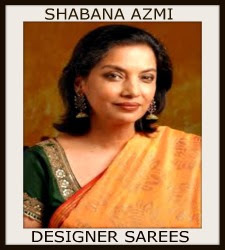 It is a black embroidered netted dupatta with embellished applique patch work border. Embroidered sequins buttes and small patch work designs all over dupatta. 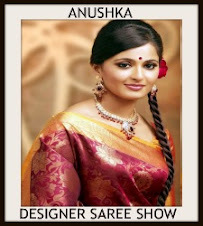 Paired with designer embroidered short sleeves saree blouse with round neck pattern. Embroidered mirrors all over blouse. Bollywood and South Indian actress Neha Dhupia in beautiful Anju Modi lehenga at Filmfare Awards 2014. Cream printed designs work all over lehenga. 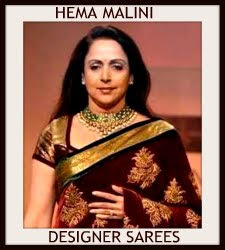 Contrast with black designer sleeveless saree blouse. Blouse designed by Payal Singhal. Bollywood actress Neha Dhupia in velvet Lehenga from designer Manish Malhotra.Its embellished with broad gold zari border festooned between thin violet velvet border and parsi chain work gives complete look it.Paired with matching net dupatta at CPAA Charity Show 2013. Bollywood and South Indian actress Neha Dhupia in beautiful black designer plain georgette saree with black plain border. 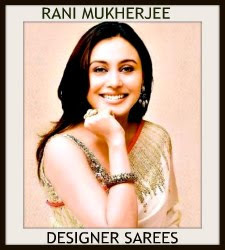 Designed by Nupur Kanoi at TSR TV9 Awards Presentation event 2012. Gold embellished with patch work designs around the black border. 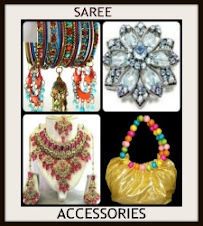 It is paired with designer embellished sleeveless saree blouse with ‘V’ shape collar neck pattern. Bollywood and South Indian actress Neha Dhupia in beautiful pink designer bridal lehenga at Day 3 IIJW 2013, Delhi. Heavy gold embroidered sequins buttes,mirrors,zardosi and embellished with patch work all over lehenga. Gold embellished work through out green border,followed by gold threads. It is a pink netted dupatta with green border. Embellished with patch work through out green border. 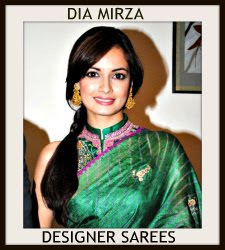 Paired with green designer embroidered short sleeves saree blouse with square neck pattern. Bollywood actress Neha Dhupia in beautiful black designer saree. 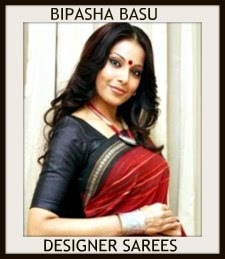 Designed by Satya Paul at Baisakhi Celebrations. White printed designs on it and green plain border. 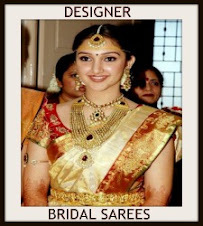 Paired with white designer sleeveless saree blouse. Bollywood and South Indian actress Neha Dhupia in beautiful black designer lehenga with red and grey double border. 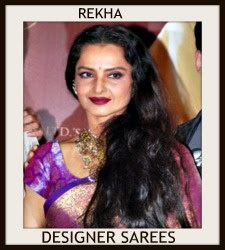 Paired with black designer sleeveless saree blouse with ‘V’ shape neck pattern.Designed by Anamika Khanna at Day 2 LFW Summer/Resort 2013. Bollywood and South Indian actress Neha Dhupia in beautiful pink designer embroidery georgette netted saree, embellished with patch,thread,zardosi and silver embroidered border paired with designer embroidered short sleeves saree blouse with wide neck pattern. Bollywood and South Indian actress Neha Dhupia in beautiful pink designer georgette saree with printed horizontal lines all over saree and border paired with designer sleeveless saree blouse. Bollywood and South Indian actress Neha Dhupia in beautiful black and white designer camera print work saree with white border work paired with designer quarter sleeves saree blouse for back from designer Masaba at ‘Maximum’ Music Launch.